It's already been 4 episodes and I'm in love with it, much more mature protagonist unlike yuya and yuma,Yusaku is too badass similar to Yusei. I thought yugioh's popularity is going to go down and down, but after that I've changed my mind it's alottttt better, with darker and more mature plot. The dueling is great too and action packed. After this, I've really changed my mind and I'm so happy that Yu-Gi-Oh! is back on track. This is what we've been waiting for! Thank you, Crunchyroll! Honestly, I felt like I'm too old for this. I'm a fan of Yu-Gi-Oh! since Duel Monsters, no... even the season 0. I thought ARC-V will be the end of Yu-Gi-Oh! and before the PV of VRAINS came out, I feel like I just wanted to stop watching animes. But then, I watched the VRAINS's PV and I was like... Hey, I feel like this is interesting. You know, try to give my last shot for this. I've watched the LABO and makes me still wanted to watch VRAINS. The first episode aired, and I would say this show is going to be amazing! New cards, New summoning method, New game mechanics, New rules, etc. It's a whole new era of dueling! Also, I like the fact that the protagonist is a lot mature than the previous two. The second episode makes me more thrilled by the backgrounds of those characters. The story itself is sometimes unpredictable. I also liked the humour between the protagonist and the sidekick :P. Overall, I love this show! I hope the show will stay good until the end! Oh yeah, the first opening is also great! Mitsu: It makes the viewers curious what is going on in the opening itself and the show! When you were going to give up on yugioh then they pulled a miracle. 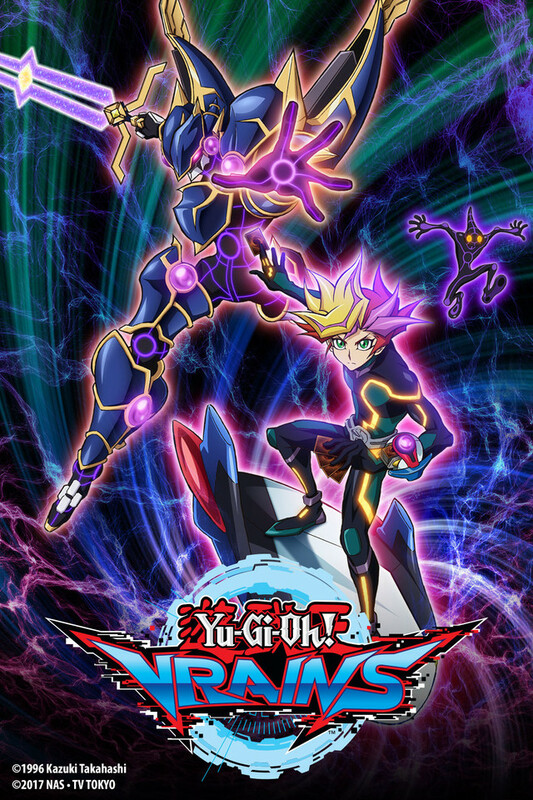 I was going to give up on yugioh but when I watched episode one I saw this was a lot more seriously then zexal and Arc V. Yusaku, the main protagonist, backstory is super interesting and is keeping me coming back for more. My rating of this show might change as it goes on but the beginning is keeping me interested. If you're a fan of Yu-Gi-Oh then you already know why you are here and I don't really need to say much other than simply: New Setting, New Rules, and as always, New Monsters take to the field in the newset saga of Yu-Gi-Oh. Welcome to Yu-Gi-Oh VRAINS! This 6th one in the series and 5th as spin-off from the original is very great in plot, character development, and of course, dueling. The new rules and dueling format may take awhile to accept if you are die-hard fan and duelist yourself, but enjoy! Hard to say seven episodes in where the series will end up, but I am telling you to check out this series if you enjoyed previous Yu-Gi-Oh shows. The show is dark, has an interesting protagonist, complex characters, and a plot that keeps you guessing. If you have not seen a Yu-Gi-Oh since the original, GX, or 5Ds, I urge you to give this new show a chance. You will enjoy having an older, calmer protagonist and a mature plot that engulfs the viewer from the very get go. The reason "SharkBook" gave this a 1/5 with a long explanation is that he is not, nor was, a fan of the Yu-Gi-Oh animes. He states that "he did not enjoy GX, Duel Monsters, or anything else for that matter." That being said, I am not sure why he felt the need to watch VRAINS, since at the end of the day, Yu-Gi-Oh is a very niche anime. You need to enjoy the trading card game to a degree, and understand that the plot sometimes does not come first. Therefore, if you have not watched a Yu-Gi-Oh anime before or have never enjoyed a Yu-Gi-Oh show, VRAINS most likely will not be your cup of tea. If you have wanted to watch a more yu gi oh show from the previous once expect the original and 5d than this is for you.The story is about a young male who one day receieve a special Ai through hacking.This Ai comes from a another dimension called cyber space and their are two diffrent groups wants this Ai. The first one is a company called SOL Technologies Inc and the other one is Knights of Hanoi.At the day our protagonist is called Yusaku Fujiki but at night he is famous for be called the Playmaker.I think so far this anime storyline developed more into a more mature show where our protagonist dosen´t cry over small things. This shows that this is what we the fans or a random watcher have wainted for so i do recomend specially if you are a duelist to watch this. Yusaku instantly manages to seperate himself from protaganists like Yuma and Yuya by bieng more mature, his choices aren't based on whims like with Yuya and Yuma but on logic. This series re-establishes the 'entertainment dueling' from Arc-V, but better, giving it a clear and more logical meaning. Definitly worth a watch if you liked 5d's. after watching the first seven episodes, I can say for certainty the writing direction is heading in the right places. we haven't seen too many duels, but that is perfectly fine, it allows the writers to give the viewers a glance at the complexities of the characters, seeing their motives and to give them a proper introduction. So far the duels haven't been all that exciting, but those duels have a degree of meaning behind them, it also gives the impression that there is a certain amount of danger to the duels that each character partakes in. The writing team has also done a fantastic job of vilifying the Knights of Hanoi, in previous series, I felt like the writers dropped the ball with the villains, but the writers have shown us, just how dangerous they really are and how powerless they can make certain people. It's certainly very refreshing to see which gives great promise for the rest of the series. As for Yusaku, he is a bit of a loner, doesn't want to stick out as it could put people in danger if they knew who he was, but he gives me the vibe of the anti-hero, he has own motives, his own persona which is separate to the previous protagonists, maybe he will open up more, but I do enjoy the fact that he is cool, calm and collected and he does things his way. So...yes, six episodes in is too early to say that it's the best in the series since GX but I'm at least confident to say that it's going to be better than Zexal & Arc-V. It has an annoying gimmick to the duels a la 5Ds but the format of their Speed Duels are similar to the (fairly) recently launched mobile game Yu-Gi-Oh! Duel Links so it feels like a great part to jump back into the series. So far this seems to be far less childish than the last two series & the overarching plot is already more interesting to me than how 5Ds started. There's plenty of time for this series to turn for the worse but I'm hopeful that this will be the series to get me back into the show. Biggest Criticism so far: Link Summons are potentially as broken as Pendulum summons but we'll see. On a way side note, this makes me want a Mixed Reality (AR/VR) version of Yu-Gi-Oh! even more.